The development of the residential solar lease structure by large national installers (Vivint, SolarCity, and Sunrun) was the main driver of solar growth beginning in 2010 after the financial crisis. The lease offered consumers immediate utility bill savings with no money down and no maintenance and was also attractive to Wall Street banks. 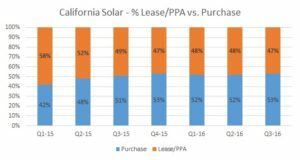 As the solar financing market matured and consumer credit markets recovered, solar loan options increased and now more consumers decide to purchase a solar system vs. lease. In California, purchasing surpassed leasing in Q3-15. The lease vs. buy decision for a solar system is similar to that of a car. As with a car, a solar lease can be thought of as a loan – they are both contractual payments over a period of time to use an asset. If you use a loan, you are borrowing money and paying interest and principal overtime. If you use a lease, the leasing company borrows the money and pays the interest and principal overtime with your lease payments. The easiest way to decide between a lease and a loan all other non-financial considerations being equal (energy savings, equipment quality, intangible priorities) is to compare the payments. There are several nuances to the payments that make a simple monthly payment comparison not an apples-to-apples view (for a detailed review of the numbers, jump to Running the Numbers). We advise reading the entire guide, but our summary recommendation is if you have the tax exposure to realize the federal solar tax credit, you should purchase (cash or loan) the solar system. Purchasing your solar system will typically generate more savings (in aggregate and on a net present value basis) than a lease, primarily because of the leasing companies profit requirements and will also give you more control over your system. The solar lease vs. buy decision should be based on an evaluation of your specific goals and financial situation. Use the table below to determine what is right for you. Although a solar purchase will likely result in the greatest savings, there are several advantages of solar leases that should be taken into consideration. The easiest way to decide between a lease and a loan all other non-financial considerations being equal (energy savings, equipment quality, intangible priorities) is to compare the payments. There are several nuances to the payments that make a simple monthly payment comparison not an apples-to-apples view. Once we have a set of payments for the loans, we can run a net present value calculation to determine which option will generate the highest net present value of savings. Tax Credit – Solar systems are eligible for a 30% federal tax credit, which reduces the cost of the system. When you buy a system with a loan, you receive the tax credit, but when you lease a system, the leasing company receives the benefit (solar lease tax credit). For an equal comparison, we can reduce the amount of the loan by the tax credit and assume payments on the adjusted loan amount. Term and Renewal Assumption – Similar to the car loan vs. lease decision, with a solar loan, you own the system after payments are complete, so you retain the residual value (in the form of future utility savings) whereas you do not with a solar lease. Most solar leases and solar loans last 20 years, but a solar system can last for 25 years (or even more). So we can assume a lease renewal and no payments on the loan for years 21-25. Fixed vs. Increasing Payments – Solar leases include “escalators” or an annual increase in the payment (which the leasing companies attribute to future electricity rate increases) whereas a loan is a fixed amount for the life of the loan. In this example, we used the sample lease contract and terms from SolarCity, which is for a 4.25 kWh system that generates over 5,500 kWhs of power a year with an initial lease payment of $825 per year or approximately $0.15 per kWh. The lease term is for 20 years and the payments increase by 2.9% every year, which is meant to reflect the expected utility rate increase. 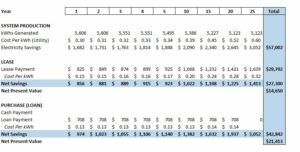 For comparison to the loan, we have assumed a 5 year renewal after Year 20 and we have also assumed a current cost per kWh of $0.30 using the SDG&E tiers (check your utility bill for most recent estimates). As the chart below illustrates, the lease generates immediate savings and $27,300 ($14,650 in present value terms). over the life of the lease. For the loan, we assumed a price of $3,000 per KW ($12,750 total or $8,925 post federal tax credit), which is close to current market rates. We assumed a 5% interest rate on the loan (rates can vary depending on credit score) and used a loan calculator to determine the monthly payment of $59. The purchase generates lower savings than the lease initially, but savings increase vs. the lease overtime as the loan payment is fixed. Note that savings on the loan increase significantly after year 20 when loan payments are finished, but the system is still active for another 5 years. The total savings on the loan are $42,842 ($21,413 in present value terms) or more than 50% greater than the lease. These are sample terms, but fairly close to market examples (a Consumer Reports analysis found a similar result) and you can use this method to compare lease vs. purchase quotes. Solar Purchase: Cash or Loan? If you have decided to purchase your system, you will have the option of using a loan or cash. The simplest way to approach the loan vs. cash decision is to determine if you have higher after tax investment return opportunities (or consumption uses) for the cash than what you are paying on the loan. Scenario 1: Investment Alternatives with Rates Higher Than Solar Loan: Lets assume that you could earn 15% post-tax return on a rental property with the $10,000 you would have spent to purchase the system. You would receive $1,500 on the rental property and $1,200 (savings net of annual loan payment) for a total of $2,700 or 35% more ($2,700 vs. $2,000 utility savings). Scenario 2: Investment Alternatives with Rates Lower Than Solar Loan: Now lets assume you can only receive 3% post tax on corporate bonds. You would receive $300 on the bonds and $1,200 net for a total of $1,500 or less than the return of the solar system. Another important consideration that is not factored into the above analysis is the risk of each of these alternatives is not the same. Solar savings is not 100% guaranteed, but certainly less volatile than common stocks or other assets that are yielding 5% post-tax, so it may make sense for some people to pay cash for a system.